Camping World package deals allow all the tent essentials to be purchased with just one click, also saving you money when purchased as a package deal. The Aero TL is the ultimate tent for the family on the move or a couple who want some room to spread out. Fully inflatable with a large living space, up to 2 bedrooms and an awning area featuring the gull wing door, with tinted PVC panorama front door and roof skylights. Constructed from a high performance and long lasting 200gsm 65/35 Polyester cotton. Designed to work and Built to last! 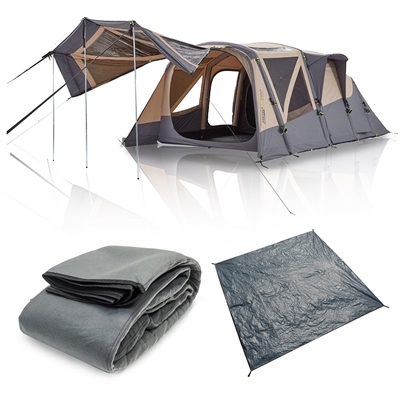 The Aero TL Pro features full head height throughout the tent. The peak height of 2.3m creates a feeling of space inside the tent and provides unrestricted access to all parts of the living area. The extra tall inner tent height of 2.05m ensures easy access in and out of the bedrooms. The lower wall height of the bedrooms increases the stability of the tent and reduces the exposure to strong winds. The front awning area has a minimum height of 2.0m. Angled pole corners further increase the usable space on each side of the awning. The awning area of the TL Pro provides a protected storage area, wet weather access when closed and a large open plan door when rolled away. The front tinted panorama windows offer privacy and weather protection without restricting the view. The Gullwing door can be used as individual entrances on either side, completely rolled away, or poled out with the included awning pole set for extra shade. The door in to the main living area features a 360 zip which can be unzipped entirely and folded away neatly into a storage pocket. The door features a full mesh panel with internal cover allowing control of both ventilation and privacy within the living area and can also be toggled back half way when required. Inside the living area, a fully sewn - in floor creates complete protection in all weather. Doors on either side of provide easy access directly into the tent and also allow airflow from one side to the other. Large tinted side windows combined with mesh airflow windows provide a number of privacy, light and airflow options. Power cord access beside the rear room allows power cables to enter the tent without obstructing entrance ways. The rear sleeping area can be divided into a 3+2 configuration with zip out divider between each section. Each room features its own entry exit and is constructed from light diffusing fabric. The room features twin doors onto each dividable room. A row of storage pockets on living area side of the room help keep things in their place and internal webbing loops allow lanterns to be attached. The Aero TL has many ventilation options. The large 360 front mesh door allows great airflow right through the length of tent. Side windows and mesh doors in the living area provide airflow across the tent. Lower protected vents provide air circulation at night and during poor weather, reducing condensation. During cooler temps mesh panels can be closed while tinted PVC panels remain open, keeping the tent warmer without restricting the view.